Medical play can greatly benefit children undergoing treatment or follow up care for retinoblastoma. Through medically themed play with real or toy medical equipment, dolls and teddy bears, children safely learn to master medical procedures, process their own health care experience, and reduce their anxiety about the hospital environment. Medical play always has part of its content medically themed and/or includes the use of medical equipment. Medical play may be offered or initiated by an adult but is voluntarily maintained by the child. Medical play is usually enjoyable for the child and is often accompanied by laughter and relaxation. However, the process of play can be intense and aggressive. Medical play and preparation are not the same. They are not interchangeable. When an adult attempts to prepare a child for a medical event by demonstrating a procedure or familiarizing a child with equipment, education may occur, but not necessarily play. Play may follow familiarization if play opportunities are made available. McKue, K (1988) Medical Play: Expanded Perspective. CHC.Winter Vol. 16, #3. Offer all medical play well before hospital visits. Incorporate it into regular play activities throughout the day. Try not to single out a specific “medical play time”, and give your child a chance to invite you into medical play when he wants to explore it. Mix equipment (such as anaesthetic mask), medically themed toys, story books and puzzles with other toys. Let your child discover and play with them at his pace. Medical play activities can take many different forms. There are four categories of common medical play: role rehearsal/role reversal, medical fantasy play, indirect medical play, and medically related art. This is the most traditional medical play. Children take on the roles of health care professionals, acting out medical procedures and events on dolls, puppets, stuffed animals or other people (children or adults). Real medical materials and equipment is used, as well as specially made toys created for medical play, such as toy doctor kits, a patient puppet, a doll sized MRI or hospital bed. 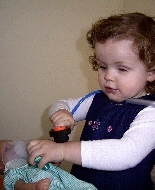 Children often use this type of medical play to re-enact events they have experienced. This also involves role playing medical themes. However, traditional play materials, blocks, doll houses, cars, trucks and stuffed animals are used to create roles and stories for medical play, instead of actual medical equipment. In medical fantasy play, children avoid contact with feared objects, but can still play out topics of concern. Many children who choose this type of medical play later progress to using medical equipment. No specialized materials are required for this type of medical play. Hospital themed activities such as puzzles, games and songs enable familiarization, exploration and education relating to medical experiences. This type of play also uses medical materials in non-traditional ways, such as using syringes to squirt water, and using IV tubing as drinking straws. This offers many different ways for a child to express themselves, their understanding of and reactions to their medical experience. Art activities can vary greatly, including painting, drawing, collage and 3D sculptures. Basic art materials are appropriate: paint, paper, markers and glue offer a wide range of choices. Including some medical materials, such as band aids, plasters, gauze and tongue depressors can enhance the medical theme. Many children’s books about going to the hospital are available at mainstream stores. Reading stories about hospital experiences help children grow familiar with the medical professionals they may encounter. They also learn about the steps they will go through on the day of their procedure. Creating a personalized story of your child’s specific medical experience is a wonderful way to familiarize your child with each of the stages of different treatments and medical appointments. Use photos of your child, or your child’s own drawings to illustrate the book. You can take photos of the hospital, clinic, medical team members and familiar places associated with the hospital (pharmacy, optometrist, ocularist etc..). This will enhance the story and help your child remember each part of the hospital and each member of the team. Let your child overhear you “bragging” to someone about his success with practicing the medical procedure. Encourage him to share this amazing skill with friends and family, so long as you feel comfortable sharing too. The praise, particularly for toddlers, is a very valuable encouragement.